Something about the name of the stat was bothering me. If you look at it in a purely logical way, the percentage you get from the formula relates to the number of attempted forehands that don’t result in errors. For some reason, I thought “Efficiency” would be a good word to include there, but I don’t think that makes sense. Particularly because after doing forehand and backhand tracking during some of these matches I realized that there was an efficiency component that came out of the analysis but that wasn’t properly addressed, purely because I used the wrong word for the stat. For example, after tracking Serena Williams’ forehands and backhands, I realized just how efficient she is in terms of groundstrokes hit during a match (i.e, she doesn’t have to hit very many to win). On the other end of the spectrum, Andy Murray and David Ferrer played a grueling Miami final that was as inefficient as it gets – yet Murray came out of it with really great numbers for the stat I created. In the past two days, I’ve tracked Rafael Nadal’s forehands and backhands during his round of 16 match vs Phillip Kohlschreiber, as well as during his quarterfinal match against Grigor Dimitrov. What I saw during the Kohlschreiber match got a lot of ideas flowing in my head, even though it was a classic Nadal-in-Monte Carlo romp. And rather unexpectedly, today we got a very different match: Grigor Dimitrov became the first man in 8 years to come within two games of beating Rafael Nadal in the principality (Gasquet was up a set in the 2005 semifinal and lost the second 6-4, but never got to 4-all – Nadal served for the second set at 5-3, got broken, but broke again to force a third set. As an added bit of trivia, Nadal served for the 1st set, got broken and lost it in a breaker. Gasquet was then up a break early in the second set). As a reference, that’s 58 fewer groundstrokes than David Ferrer had to hit during his match against Kei Nishikori in Miami. And both matches were straight set affairs where the loser only took 6 games in the entire match. But back to the 58 number: to get an idea of what it means, 58 groundstrokes are around half of what a player has to hit during a match (disclaimer: my sample is still small). Or, if you’re Serena Williams, that’s more or less how many groundstrokes you hit during an entire lopsided set. – Only 72 of the total goundstrokes hit during the Kohlschreiber match( 37%) took place during Nadal’s service games. That’s an average of 8 groundstrokes per service game. And since you have to win at least 4 points to hold serve, we can assume that Nadal averaged just two groundstrokes per point played on his service games. If that’s not efficiency, I don’t know what is. Nadal’s serve, just like his forehand, gets an extra boost on the clay. All the spin he puts on his delivery becomes much more difficult to handle for opponents, granting Nadal quite a few easy service points and games. – As you can see, Nadal hit 28 more forehands than backhands during the Kohlschreiber match. That’s a high number, but one that makes sense: clay gives Nadal more time to run around his backhand and unleash his deadly forehand, which is custom made to excel on this surface. Going back to the numbers, Nadal averaged 14 more forehands than backhands per set during the round of 16 match. If you look at the dynamic between service games and return games, you see that Nadal tended to hit more forehands than backhands in both situations, but more so when he was serving: during this match he averaged 9 more forehands than backhands during his service games each set, as compared to just 5 more forehands than backhands during his return games. – Nadal was very consistent today…but not nearly as efficient as yesterday. In terms of sets, Nadal’s first set today (the score ended up being 6-2) was perfectly in line with the two Kohlschreiber sets: Nadal hit around 100 groundstrokes during it. Pretty efficient. One aspect of this efficiency changed, though: Nadal actually had to hit more groundstrokes during his service games in that first set in his return games (7 more). Grigor Dimitrov did an excellent job returning Nadal’s serve today, it should be said. Working in the Bulgarian’s favor was the fact that the conditions helped keep Nadal’s ultra-spinny serve low, taking off some of its bite. 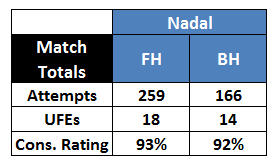 Still note that Nadal’s Consistency Ratings are still above 90% (for today’s match, TennisTV and I only disagreed on 2 forehand unforced errors). That’s still remarkable, given Nadal’s patchy performance in sets 2 and 3. – Nadal had to work a lot harder during his own service games against Dimitrov: 62% of his total groundstrokes came during them. As I mentioned above, Dimitrov had a very good return of serve performance today. So much so that he created 2 more break points than Nadal did in the entire match. Thus, Nadal went from averaging 8 groundstrokes per service game during the Kohlschreiber match to over 20 during today’s quarterfinal. That’s a very significant turn of events, no? On the other hand, Dimitrov had the kind of serving day that made me write this after his great run to the Brisbane final. The Bulgarian has a very nice serve (when he’s not double-faulting four times in a single game), and that might be the key to his rise in the rankings this year. Today he finished with better numbers than Nadal: the Bulgarian won a hefty 79% of points played on his first serve, and a not-horrible 48% of points played with his second serve (Nadal finished with 65% and 44% in those same categories, but he did serve 79% 1st serves, compared to 54% for Dimitrov). – Nadal hit an astounding 97 more forehands than backhands today. That’s an average of over 32 per set. Which is nuts. Interestingly enough, it was the third set that threw the average off: Nadal hit 28 more forehands than backhands in sets 1 and 2, but hit 39 more forehands than backhands in set 3. Again, Dimitrov had a huge influence in how this dynamic played out: the young Bulgarian’s one-handed backhand fared spectacularly well today, aided by the favorable conditions. Why did the weather matter so much? Simple: Dimitrov had to hit fewer high backhands than he would have had the match taken place on a warm, sunny day. That’s crucial for a pro using a single-handed backhand (just ask Kohlschreiber, who had to play Nadal in warm conditions the day before). Dimitrov also covered the court beautifully, particularly in sets 2 and 3, forcing Nadal to hit a higher number of groundstrokes than the Spaniard had in the previous three sets. Another issue during that third set was Nadal’s own issues with his backhand: it was interesting to see that early in the third set his Backhand Consistency Rating was in the 70s – a never-before seen low. The unforced errors were flowing freely from that wing, so it’s not a surprise that Nadal tried to hit as many forehands as humanly possible. It’s pretty clear that today’s match against Dimitrov is more like the exception to the rule for Rafael Nadal. After all, it was the first time since 2011 (vs Murray) that the 8-time Monte Carlo winner had lost a set in this tournament. In fact, this was just the seventh set that Nadal had lost on the royal dirt since 2003. That’s seven lost sets out of 45 matches that have ended in wins for the Spaniard. In fact, Nadal has never lost more than two sets during the entire week of the tournament in any of the ten times he’s played it (counting the current edition). – During his past 10 participations at the Monte Carlo Masters, Nadal has handed out 8 bagels, 22 breadsticks, and 17 6-2 sets. – That’s 37 sets that have included at least two breaks of serve in his favor. – Since Nadal has played 105 sets of tennis at this event since 2003, we can easily calculate that 35% of those sets have been lopsided affairs in Nadal’s favor. Finally, let’s not forget that Nadal has won half of his Monte Carlo crowns (4) without dropping a set. 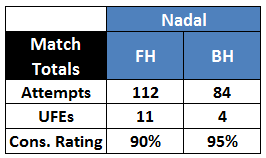 The Kohlschreiber match shows us just why Nadal is so dominant here: he’s able to win in a pretty efficient way. Whenever you are able to consistently overcome your opposition with ease, you will dominate. These numbers also go against the conventional wisdom that says that Nadal has to work harder than most to win matches. That’s just not the case in Monte Carlo, at least. As for today’s match, it’s quite telling that even though the Manacor native had one of his poorest performances of his Monte Carlo career, he still found a way to beat a most inspired and dangerous opponent. Which is another sign of why Nadal has been able to dominate in the French Riviera: even when he’s not nearly at his best, he has enough resources to pull through. Thank you for the nice words, Jennifer! I’m glad you like this. De nada! Great article! The separate effectiveness/consistency stats really do clear up things a lot more than effectiveness stats alone. It’s kind of frightening that Nadal doesn’t have to be anywhere near his best to keep winning on clay; how demoralizing must that be to his competition? Thanks, Ophelia! And yes, it has to be pretty demoralizing for people to know that only their absolute best has a chance against Nadal, even if the latter is on a B- level. That’s why he’s the greatest on this surface: his margin for error is so much greater than everybody else’s (not named Djokovic, who still has to play at an incredibly high level to have a chance to beat him). I am big Nadal fan. Are u his fan as well? Is now Novak’s to loose. What do u think? Then why is Rafa not working on backhand? Interesting to know your analysis.